Note: Too busy to write a review for this concert, I just copied this review from CNA here. As a rock music lover, I do not agreed that the sound are loud. Saw a few guys/girls were putting their fingers in their ears. The Cranberries vocalist Dolores O’Riordan’s enthusiasm was infectious. SINGAPORE: Seven thousand people turned up to catch Irish band The Cranberries in concert at the Singapore Indoor Stadium on Monday night. And many of them must’ve gone home with sore legs. From the moment The Cranberries took to the stage, many of the concert goers got on their feet to sing along and they didn’t sit down at all throughout the concert. “It’s great to be back in Singapore. The years just flew by. It’s been too long,” said The Cranberries vocalist Dolores O’Riordan as she pranced onto the stage in an all-black ensemble. The Cranberries kicked off the evening with the rousing song “Analyse”, with the crowd dutifully swaying to the music. But it was only when the band began to play the intro for their hit song “Linger” did the audience start to go wild. 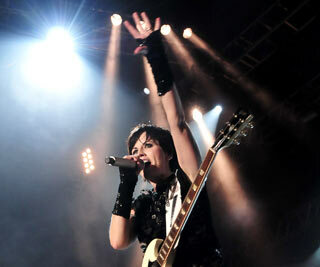 The Singapore Indoor Stadium came alive as O’Riordan incited the crowds, pumping her fist energetically into the air. “Come on. Get your hands up and sway!” the singer said. Her words were barely heard, drowned out by the excited screams of the audience. O’Riordan scarcely needed to sing, with the crowd obliging her every time she pointed the microphone towards the crowd and asked them to sing along. Still, she showed off her impressive vocals and soon whipped the audience into another frenzy with “Ode To My Family”. The venue looked like a sea of waving arms when most of audience members stood up and swayed to the soulful song. But for all the musical brilliance the band displayed, it was let down by the sub-par sound system at the Singapore Indoor Stadium during their performance. O’Riordan’s voice was often drowned out by the sound from her band mates’ instruments that appeared to have had their output levels set way too loud, leaving audience members not only unable to hear O’Riordan but even hard of hearing after a few especially loud segments of the concert. The Cranberries also went a little overboard with their use of strobe spotlights. The concert should probably have come with a warning that it may cause epilepsy. It was painful to look at the stage at some points of the concert, such as when the band performed “Salvation”, because of the numerous flashing strobe lights that framed the stage. However, the band’s fans overlooked these problems and continued to respond enthusiastically when The Cranberries played their signature tune “Zombie”. This time, the crowd’s screams overwhelmed even the overly-loud guitar and drums. Just when the stage lights went out and it looked as though “Zombie” was the last song of the night, O’Riordan returned dressed in a purple gown and proceeded to perform a few mellower pieces like “Empty” and “Dying In The Sun”. But it was the Irish quartet’s anthemic “Dreams” which brought the night to a close. Some lucky members of the audience were delirious with joy when O’Riordan descended from the stage to shake their hands midway through the song. The singer then bounced back on stage and took a bow, signaling an end to an excellent evening of music. “We’re always going to come back here because you guys are amazing!” said O’Riordan, giving the audience one last wave before leaving the stage. Anugerah Planet Muzik (APM) 2011 marks the tenth anniversary of the APM. The Malay music industry awards presentation event organised by Singapore radio stations Ria 89.7FM and Warna 94.2FM failed to return back to Singapore last year (2010) from Jakarta (Indonesia) where it was hosted there in 2009 and Kuala Lumpur (Malaysia) in 2008 due to “commercial considerations”. This is my second time attending APM and the first time watching an event at The MAX Pavilion (Singapore Expo). It was back in 2005 at Suntec Convention Hall 601 and 602 that I watched the first music awards show. I was not satisfied with the event where the place get hotter when the show started. Not sure whether the aircon broke down or no one was checking the temperature. I was also not happy that the “APM guards” keep blocking the audiences’ view and catching audiences who took pictures and videos. 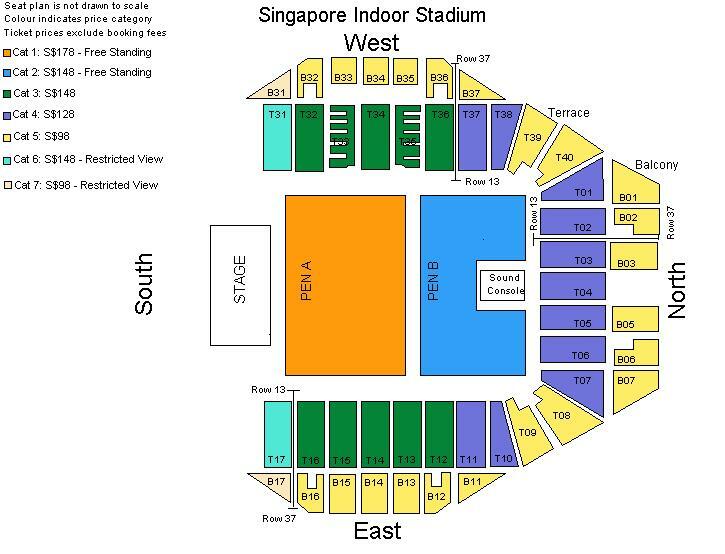 Due to this, I decided to buy the expensive ticket (SGD81) and got the B3 Section, Row 2 and Seat 10 which was one of the tv camera favorite spots. Yeah, I was on tv most of the time during the 3 hours show! Friday, 15 July 2011. The show was supposed to start at 8.30pm as shown on the ticket but only started at 9pm. They surprised us by having the “Red Carpet” inside the auditorium hall. As I was sitting in the middle of my row, I decided not to get out of my seat and run forward to capture the performing singers walking on the red carpet. 9pm and the show was telecast live at Suria and Astro Ria. Opening act by Orkestar Trio and Bloco Singapura before Sarah Aqilah, Hady Mirza, SleeQ, Sezairi Sezali, Taufik Batisah and Rahayu Ridwan with Senyum (Smile) song. Great combination and performance by the Singapore competitions winners (Singapore Idol and Anugerah). I guess SleeQ was there to assist with the rapping parts. I didn’t get it why the two awards were called Best Vocal. For me it should be called Best New Artist (Male/Female). If it was based on vocal, Roze should had won Best Vocal (New Female Artist) instead of Amanda. Boring Selamilah Cinta performance by Amanda Imani and Ajai (on keyboard) followed by Sezaire Sezali (Matahari) and the performance by Sandhy Sondoro (Malam Biru). I’m not sure how Sandhy won the best vocal based on this live show. The judges should had attended the nominees’ live performances before they decides the winners. Judging by listening to their CDs is not the right way. RZ, Sarah Aqilah and Dyn Norahim “Main-Main” joke. 3 Suara deserved this award based on their live performance. Great “Tolong Ingatkan Aku” performance by Ana Raffali, Sleeq (Untuk Dia), Atilia & MonoLoQue (Kekanda Adinda) and group performance for “Kalau Berpacaran” replacing Altimet & Suhaimi Meor Hassan. Really enjoyed during this segment. Scha Al-Yahya & Syazwan Zakariah, gandingan tak sesuai langsung! I preferred Nurul to duet with Ajai for this song. Best performance by Aryan Band lead by Still Youngz’s vocalist, Ikhsan. Not sure whether the former band has been disbanded. Malaysians’ viewers were questioning the Most Popular Regional Song winner as they claimed that they had never heard of this song before. For me, regional awards should never be introduced in such an event as it will make our neighbouring countries feel bad when they think their artists should be the one winning it. Faizal Tahir was not aware that he had just won the Best Male Artist award. The organisers should had told him to prepare for the award or getting someone keeping track of the winners’ where-about. An artist who are preparing for his/her performance do not have the time to watch the monitor’s screen all the time at the back-stage. This incident also happened when 3 Suara was announced as winner, Ning Baizura was at the back-stage and it took a few minutes for her to re-unite with the other members. They looks like perfect couple eh? Jac , Siti & Melly worst ever performance! They seems not having a rehearsal together. It was raining heavily outside. Can you hear it, tv viewers? Faizal feeling hot. His performance began late. Took out his shirt and buttons. I was thinking that his sickness came back! or got the viral from the 3 Diva? He felt that it was his worst ever performance. I was surprised that he angrily used his hands to hit the cymbals. Siti needs to learn english! The viewer were laughing at her when she pronounced “confort”. I was not sure whether she was saying fall and falling or boy and bowling respectively during the chorus. It is good that the organisers took Siti out from this category as she had won this awards since the day APM was born and awarded her with the Most Popular Regional Artist For More Than A Decade award. Other than Didi Alias, I found that this year MCs (Adi Rahman, Fiza O – Singapore’s Ziana Zain and Daniel Mananta) were the most boring one. 1. The dot-matrix backdrop screens was a bad choice! I’m not sure whether they purposely used it to destroy the pictures’ qualities. 3. Why was there no pamplets given? Budget? They had it the last time I came. These tells me that they were selling more Pen A tickets than Pen B tickets, not proportional to the original seat plan that Pen B should start from T12/T37 towards the end, but the Pen was moved to T11/T38. Why having Pen A & B when you have the power to make it one single Pen? For what I know, having two equal Pens is for crowd control purposes. 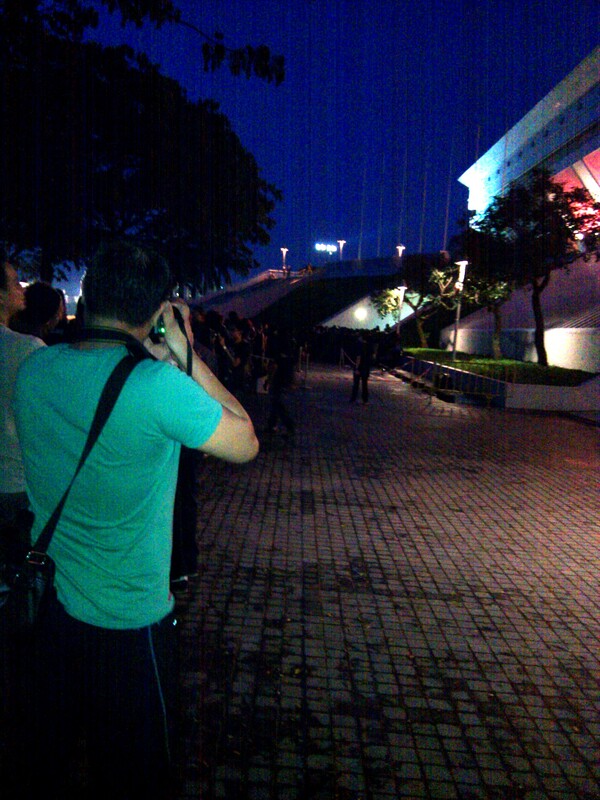 I decided to join the queue after 7.30pm. By the time I was in Pen A, Rise To Remain, a 5-piece London based metal-core band, lead by Austin Dickinson, son of Bruce Dickinson, had already started performing. The crews took about 20 mins to setup the equipments for Iron Maiden to begin their show. While waiting we did the Kallang Waves. At almost 9pm, Bruce Dickinson, 3 Amigos (Dave Murray, Adrian Smith and Janick Gers), Steve Harris and Nicko McBrain finally emerged on the centre stage and performed their first song ‘Satellite 15… The Final Frontier’ from their ‘Final Frontier’ album. Bruce Dickinson remarked that an Englishman he met had warned him about Singaporeâ€™s lifeless concert crowds. From my previous experiences watching concerts at the Singapore Indoor Stadium, I’m quite agreed with the Englishman. But this concert was different, I was surprised that most of the 15,000 fans were standing, clapping, swaying, singing and hopping like a rabbit! He also said that this will not be the first and the last concert for them. 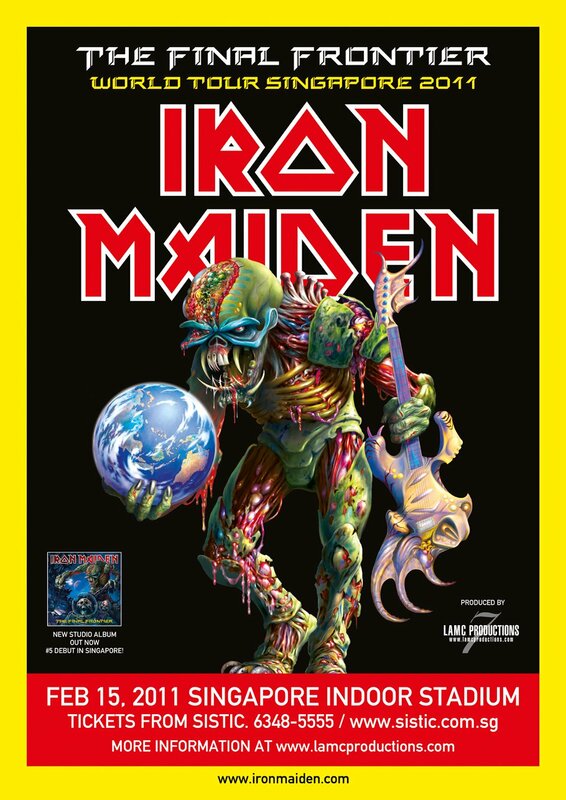 Eddie, the heavy metal’s all time favourite mascot appeared. 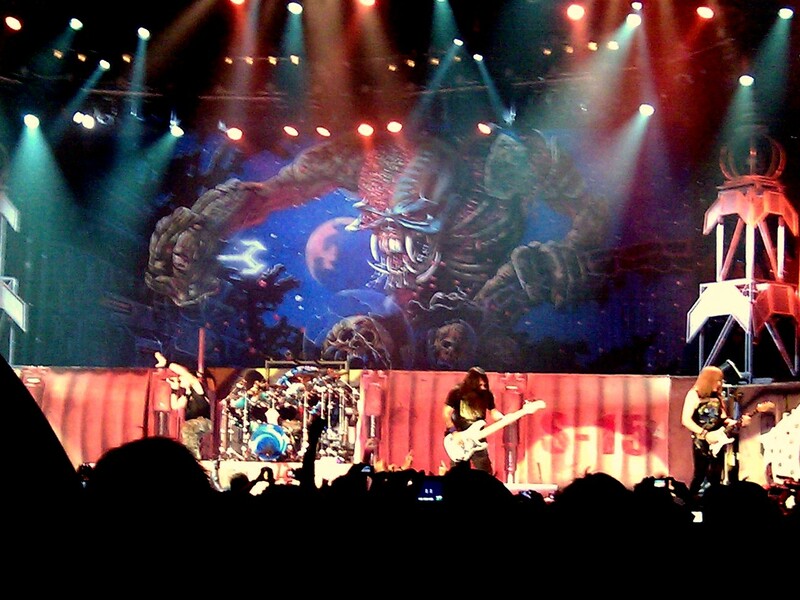 Iron Maiden did an encore at around 10.30pm. The show end just before 11pm. Just nice for the fans to take the public transports and have a good rest before start working on the following day. Rima Fakih of Dearborn, Michigan beat out 50 other women to take the 2010 Miss USA title. Rima, 24, Arab American Lebanese immigrant, won the pageant at the Planet Hollywood Resort & Casino on the Las Vegas Strip. She moved to the United States as a baby and was raised in New York, where she attended a Catholic school. Her family moved to Michigan in 2003. She strutting confidently in an orange and gold bikini, wearing a strapless white gown that resembled a wedding dress. During the interview portion, Fakih was asked whether she thought birth control should be paid for by health insurance, and she said she believed it should because it’s costly. Fakih replaces Miss USA 2009 Kristen Dalton and won a spot representing the United States this summer in the 2010 Miss Universe pageant. She also gets a one-year lease in a New York apartment with living expenses, an undisclosed salary, and various health, professional and beauty services.